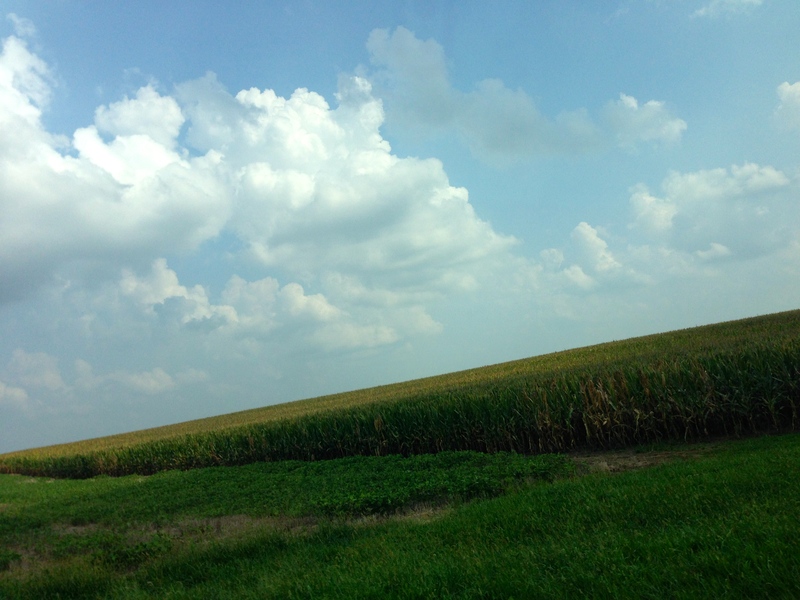 Drove by many cornfields on our house hunt. Would you believe it if I told you that a song pretty much sums up the story of our house hunting adventure? As this particular song was playing on the radio on our way to the airport and I realized just how glorious God’s promises for us had unfolded. Lay down, rest from the fight and don’t try to figure it out. After our first day of house hunting I was exhausted and couldn’t figure it out. To say I was discouraged is putting it mildly. I had been so sure we’d find a house quickly, but instead it felt like the end had started closing in. I was wondering if we’d find a home at all. It was not like anything that I thought. Jesus might as well have spoken the words, “You of little faith, why are you so afraid?” (Mt 8:26) to me, just as he had to Peter so long ago. What I didn’t realize was that there was about to be a glorious unfolding. God knew which house was right for us, a house he saved and just put on the market that week. A house that my research-obsessive-husband-whom-I-mock-mercilessly-for-it (thanks honey!) found online and added to the next day’s house viewing list. The next morning, we went and looked at this new house. This new house that God had set apart and kept out of the housing it, guided my hubby to it online at the perfect time, right after it was put on the market. I liked it from the outside, it was cute and homey. As I walked from room to room exploring the layout and spaces, I realized that this house could work for us. This house felt comfortable. As our agent said, “It makes you want to cozy up with a blanket and pillow.” It felt cozy and lovable. We looked at few more houses, but soon, I was comparing all other houses to this one house and we realized that this house was something special. See, God knew our wish list, our hopes and dreams for the new house even before we fully knew. And He saved this house, revealing it to us when it was time. God loves us so deeply and beautifully that he gave us this gift of a house that felt like home. So, we met with our agent the next morning and made our offer. Then we waited. We had to wait so we could believe that our story was far from over, that this would be a glorious unfolding. We found out that afternoon that we got the house and the next morning before we left for the airport, we signed paperwork for the new house. As we were signing, we got a text informing us that our house in CA was officially closed. I mean seriously — what perfect timing of our Lord! We closed on our old house as we signed paperwork for the new house. The entire, stressful house saga–selling and buying–was so perfectly timed and arranged by my God who loves me and cares for me. Looking back, I can’t look at all the events and not be amazed at this glorious unfolding.